I had never liked running. That's like at the top of my Loathe List. 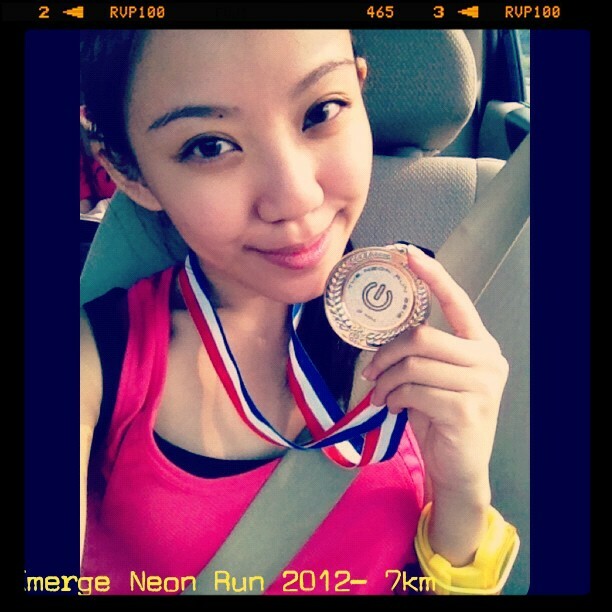 Words couldn't explain how I felt when I laid on the CHCKL carpark after crossing the finish line within 60 mins! It felt as if I lost 10 kg. It felt as if I'm the fittest woman in the world! It felt as if I could pull a van! Tried to sleep early but failed. Ended up with only 4 hours of sleep, but I was surprised at myself that I had no problem getting outta bed! What happened to Careen Tan??? This is probably the only time we can lie down on the road without getting rolled over. I so wanted to do that but Boon looked at me one kind, so I felt shy to do it. Maybe the next King of the Road. Isn't it tempting to just do a lie-down shot here? Right here?? Don't you agree it'll be epic?? So I acted gentle and shy and didn't do it. See just how ONZ we were! Took so many pictures! And no I didn't force Boon into this! Everyone was warming up and readeh to go! Paramedics and ambulances were on standby just in case people like me pengsan. The atmosphere did help a lot! While we were waiting at the starting line, there was a sea of people excitedly chatting while the loud, pumping music was at the background. 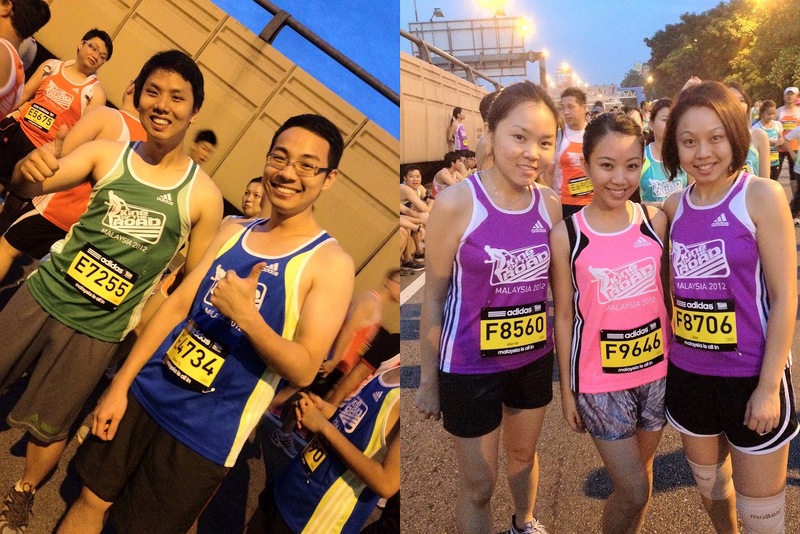 No wonder I felt so pumped up at freaking 6.30am! Couldn't believe we actually found familiar faces amongst the sea of peeps! Just take a look at this! We were kiasu so we stood quite front (even though we know we can't even make it to Top 100). Look at the people behind us! But of course, being the sweetheart that he is, he told me not to be nervous and just enjoy the run. Promised that he would run beside me :) So I was all readeh and pumped up once again to RUN and win Top 3! The whistle sounded, and everyone started to pick up the pace from walking (too many people to start off running) to running. The minute I started to find my comfortable pace (which everyone says is very important), and this happened. Boon: "Aiyo bee, I think....I wanna pee." Me: "Huh? Now??? We just started!" Boon: "Ok nevermind. I can tahan." 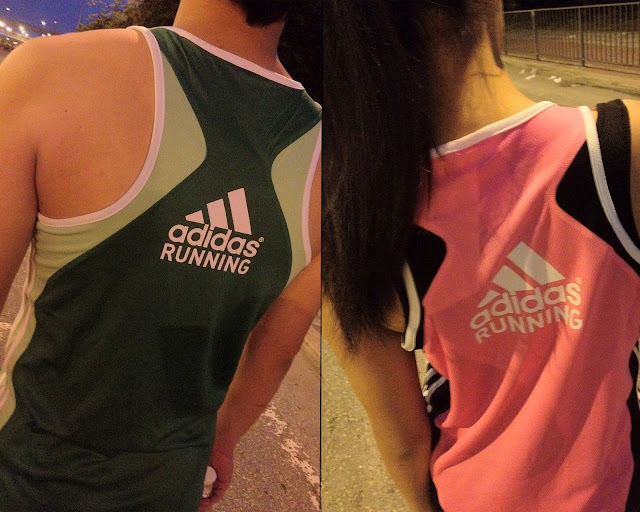 They say love keeps no record of wrongs, so we continued running! The first KM was not much of a problem. 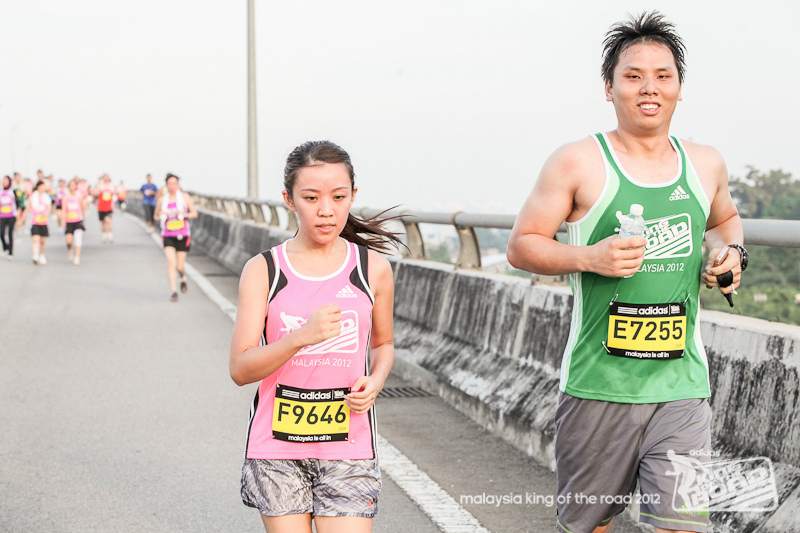 After the 2nd KM, life became tougher. As you can see, I looked pretty pissed. Pissed at what, I don't know. Just pissed. When we headed towards the toll house, I was so excited! For the first time ever, I can do THIS! After the 3rd KM, it felt a little better due to the momentum. After the 4th KM, life got tougher again. As you can see, it was a forced smile. After the 5th KM, I almost died. My legs went jelly and my vision went blur. True story. And best part was, I was ONLY HALFWAY :') Seeing people running at the opposite direction (those who already ran more than halfway) made it worse. There were paramedics on motorcycles constantly on the lookout for people who need medication, muscle spray, etc. They were so efficient that the moment you stop, even just to tie your shoe lace, they'd quickly swing by and ask if you need help. But Boon cheered me on and got me to find my "targets" along the NPE columns/pillars. It sure did help. I was so into it that I totally missed the 6KM sign to take pics. But, it was not so pleasant afterall when I saw how I looked when I was in deep suffering. This, my friends, is the face of DETERMINATION. At the 8th KM, there were people playing instruments and cheered us on. I'd say it did help a bit :) Loved the entire atmosphere! Check out the sea of people behind me! Done 10KM in 1 hour, 35 mins. Not the best, but I really thought I'd complete it at 2pm. The super cool medal! I really love how the organizers put so much attention into details. Everything was carried out so smoothly and excellently! #1: Running with people who will cheer you on helps A LOT. #2: Keep running! Never stop (except to take pictures). See you at the next King of the Road! How you get Adidas to let you register since already closed? Teach me ! You still look pretty even when you're whole wet. LOL. sounds wrong, okay. xD Anyway, i hate running too. U're so pretty even without make-up on, any tips to take care of your skin?